The 4025 has a true run-dry plunger pump and a state of the art HATZ Tier 4 diesel engine. It is a perfect unit for general cleaning in residential, industrial, and commercial jetting applications, with the added flushing power to handle many municipal applications. It has enormous versatility and can work in pipes ranging from 1″ – 48″. It can be fitted with water tanks sized 100 – 750 gallons (378 – 2,839 liters) or larger if required. 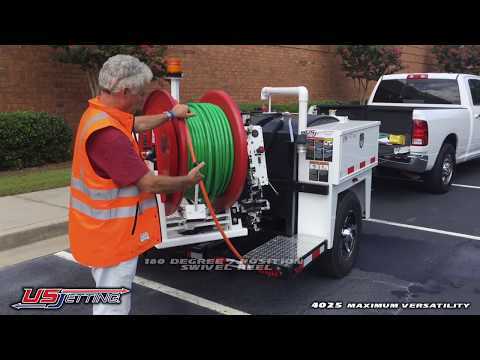 The standard unit comes equipped with 500 ft (150 m) of 5/8″ hose. The 4025 is available with different mounting options, including open trailer, enclosed trailer, open truck, enclosed truck and skid mounted. Different add-ons are also available such as control panels (with or without remote capabilities), additional hydraulic reels, alternative water tanks, mini jet kits, etc. Please click the “REQUEST A QUOTE” button, submit the form and a US Jetting Unit Sales Specialist will contact you for more details. 1/2″ Warthog Flexible SuperSpin – WS is one of US Jetting’s most popular nozzles for grease, roots, and sewer applications in 4 – 6” pipes. The 1/2″ 4000 PSI 18 GPM (4018) nozzle is often selected for restaurant and food processing facilities for its impressive capabilities with grease. However, this nozzle is equally effective in removing roots from lateral lines and descaling pipes.